A large outdoor pool a free shuttle to area attractions and a scrumptious restaurant make for a comfy base of operations for our guests at the Handlery Hotel and Resort. The sprawling two-story Handlery Hotel and Resort offers 217 rooms with free Wi-Fi 37-inch flat-panel TVs mini-fridges coffeemakers hairdryers and ironing equipment. Some also have balconies or patios with a pool view. The on-site restaurant serves breakfast and dinner or snacks are available poolside or in the lounge. Room service is also an option. The hotel also has a fitness room and meeting space. 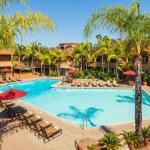 The hotel offers a free shuttle to SeaWorld and the San Diego Zoo and parking is available for an extra charge. Off I-8 the Handlery Hotel is next to Riverwalk Golf Club and less than a mile away from shopping and dining at Fashion Valley. Watch killer whales make a splash at SeaWorld four miles west or get close to giraffes and elephants at the San Diego Zoo four miles south. Beaches are about six miles west. San Diego Convention Center and Petco Park Baseball Stadium are five miles south. San Diego International Airport is seven miles away.